Tongariro volcano is a large complex volcano with about 12 craters and vents, including the steep stratovolcano Ngauruhoe, which is the focus of most activity in recent times. Tongariro with its colorful crater lakes, hot springs, fumaroles, numerous cones and lava deserts is one of the major tourist attractions of the North Island, and the famous "Tongariro crossing" is generally regarded as one of the most scenic hikes in the world. GNS Science said the earthquakes could simply be part of the background unrest typical of most active volcanoes. However, in this case they are of interest at this time because there have been so few at Tongariro since November 2012 and potentially could signal changes occurring inside the volcano. An increased number of earthquakes and possibly a weak tremor pulses appear on today's seismic recording. Weak earthquakes continue to occur under the volcano, but the general level of seismic activity has remained low. Some small earthquakes have appeared again today, but generally, seismic activity has been showing a decreasing trend over the past weeks. The Te Maari craters at Mount Tongariro continue to be active with continuous emissions of steam and volcanic gas. Emission of a steam and gas plume has been a continuous feature of the mountain since the August 2012 eruption. The gas is coming from a large fumarole and crack in a cliff just east of the Upper Te Maari crater. The main Upper Te Maari crater is also discharging gas but at a lesser rate. Fumaroles associated with a fissure farther to the east have declined and are no longer easily visible. Some local earthquakes are visible at the recent seismic recording. A series of small earthquakes have recently been occurring at the volcano. 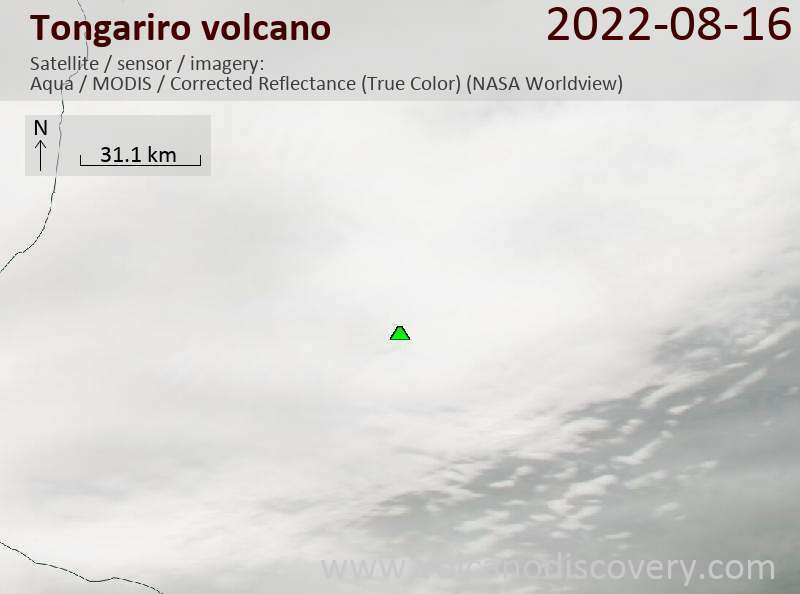 Small earthquakes continue at the volcano. The eruption occurred from the Upper Te Maari crater, in the same area that erupted on 6 August this year. Today’s eruption lasted for less than 5 minutes although local earthquake activity continued for about 15 minutes.  The eruption appears to have ceased for now, GeoNet writes. Compared to most previous weeks and months, seismic activity at the volcano has been calm the past days. The volcano continues to show increased degassing mainly from the Te Maari eruption site. The hottest temperature measured from gas vents in this area was 235 °C, while others range from 95 °C to 104 °C (GeoNet). Seismic activity overall has remained low with only few earthquakes. GeoNet maintains alert level 1 and aviation color code yellow. GeoNet reports little new activity from Tongariro. Seismicity from the volcano has remained low. It is noted that most of the activity visible on the seismograph drums is caused by wind. This morning, NZ scientists could use a brief window of clear weather to make an overflight of the eruption area which was found to be just below the Upper Te Mari crater, where new steam vents were observed. At the moment, Tongariro is calm, but eruptions could resume any time. - There was no significant precursory activity (such as sudden tremor) indicating an immediate eruption (although seismic activity had been increased since a few weaks ago). We got great news from our friend and team member Luca Montagni from New Zealand, reporting that Mt. Tongariro volcano has been erupted 11:50 p.m. in the night of Monday/Tuesday 7-8 August. Due to the bad weather there are no visible observations possible that moment. Seismic unrest continues with tremor and earthquakes visible on the seismic recordings for Tongariro. No new reports from GeoNet in New Zealand, but the alert level remains at 1. Scientists have increased their monitoring of the volcano. Gas samplings of springs and fumaroles confirm that volcanic gases above normal levels are present. A lot of seismic activity appears on the seismograph visible at Tongariro. There are no new reports by Geonet, and the status remains at yellow (1 out of 4). Mt. Tongariro volcano remains seismically active, but less than before. There are no further news from GNS science, but the alert level remains at 1. More than 20 earthquakes were recorded until 20 July, when the seismic activity peaked and prompted GeoNet to raise the alert level from 0 to 1. Compared to a background average of 2 quakes per year, the swarm is significant and could indicate magma movements.